On display here is a replica of replacement terra cotta pieces that Gladding, McBean and Company manufactured for the Woolworth Building in 2005. These pieces are elaborately decorated crockets, a type of foliage-motif ornamentation placed on spires. They were reproduced from architectural drawings of Gladding, McBean's tracery panel replacements, which were located on the north and south elevations of the 28th floor. The building's exterior is clad-or covered-with over 400,000 units of terra cotta. 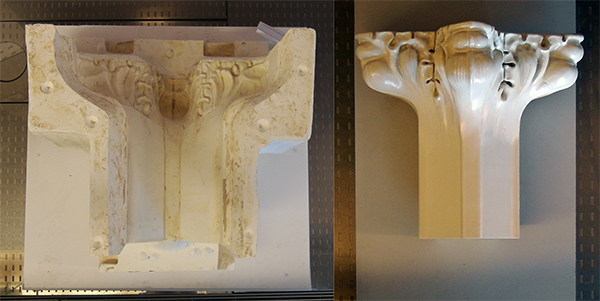 A fragment of original terra cotta ornament from the Woolworth Building is seen here. Due to lack of maintenance, the anchors attaching the terra cotta to the steel frame rusted and caused widespread damage to the terra cotta panels. Many broken pieces have had to be replaced with new terra cotta, or in some cases, an alternative material. Gladding, McBean is a ceramics manufacturing company located in Lincoln, California-an area rich in clay deposits. The company was regarded for their masterful manipulation of clay, leading to commissions for terra cotta cladding and ornamentation for many historic buildings in the United States.